It is not often that a corporate history can be told as a love story, but the roots of "Go Barefoot" manufacturing are founded on true love and affection. In 1946, World War II was ending, and Isamu Takabuki of Hawaii formed Iolani Sportswear and began manufacturing Hawaiian "Aloha" garments. He also purchased the Aloha Boeki screenprinting company in Kyoto, Japan to print his fabric with designs by Hawaiian artists. His daughter Alice, fell in love with Clarence Hara, and the story begins. In 1954, the lovers eloped to Southern California, and in the process deeply hurt Isamu. Three years later, Craig Hara (now president) was born and soon peace was made within the family. Isamu, the grandfather, sold his Hawaii businesses and moved to California. In 1957, Clarence and Isamu formed a new company and incorporated Fuji Import Company, Inc. They wholesaled imported Hawaiian shirts and robes from Japan made from silk, rayon, and cottons. Today these garments are highly prized collectors items. As the business grew, Clarence decided to expand and he applied for membership in MAGIC. Refused on the grounds that garments (at that time) were required to be made in the U.S.A. and preferably in California, Clarence immediately hired sewing contractors and started manufacturing in the Los Angeles garment district. At the same time, realizing that "Fuji Import Co." was not a viable name to merchandise Hawaiian sportswear, or to be accepted for membership in MAGIC, he selected Mr. Hawaii Inc. as the new company name. Upon acceptance into MAGIC, Clarence volunteered his time and services and became very active in the MAGIC organization. He served as chairman of various show committees and served on the Board of Directors for 27 years, and was president of Magic from 1988 through 1989. He also recognized the need for a new product label; a "handle" for his ultimate customer to grasp. On one of his trips to Hawaii to develop designs for his Hawaiian shirts, Clarence met with his old friend Sterling Mossman, a well known nightclub entertainer at Waikiki's Queen's Surf and the famous Barefoot Bar. From his friend, he received legal approval to use the "Barefoot" which was the decor of the Barefoot Bar, with footprints on the walls and steps leading to the Bar and entertainment. 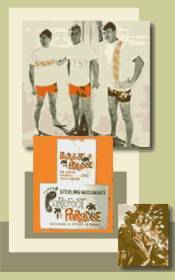 The new label then became "Go Barefoot in Paradise" (also the name of Sterling's Waikiki show) and later was shortened to "Go Barefoot". Note: The footprint logo was sold to Hang Ten in the early 1970's. Craig Hara soon found his place along side his father, and is now the president of Mr. Hawaii, Inc. For the past 50 years, Mr. Hawaii, Inc. has been designing and producing the finest quality Hawaiian shirts. These garments reflect the beauty and aloha that is found in only one place on our planet -The islands of Hawaii. Craig and Clarence still travel back and forth to Hawaii to work with their artists and to develop contemporary authentic Hawaiian prints with the same fabric company they started with in the early fifties.